In a bid to combat “benefit fraud” and the use of “cheat-identities,” Germany’s federal migration agency wants all regional outlets to fingerprint all asylum seekers, though it admits that they often lack the resources to achieve this, local media report. According to a statement from the Federal Migration and Refugee Office (BAMF), it is already impossible to get away with using multiple identities on a federal level. “Asylum seekers are registered on the basis of their biometrical data, including fingerprints, and are given forgery-proof identity documents, the ‘arrival certificate,’” BAMF said in a statement. However, the same also needs to be implemented on the regional level, as local authorities must “likewise be aware of the applicants’ identities,” BAMF notes. Julia Cordt, the federal agency’s recently appointed head, says regional immigration offices now need to take the initiative to fingerprint refugees and process biometric data as well. 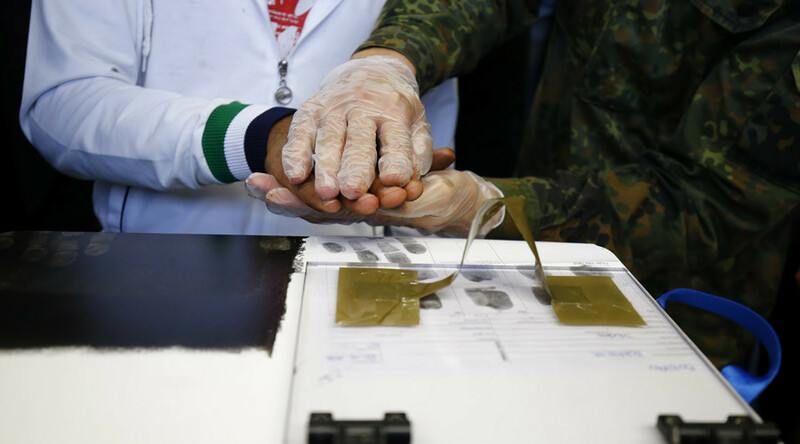 “They have to take the fingerprints of all people registering with them and compare the data with the central register,” Cordt told Passauer Neue Presse, as cited by Frankfurter Allgemeine Zeitung. It is unclear if the proposal will prove realistic, however, as more than 90 percent of Germany’s migration offices are unequipped to record biometric data, according to Die Welt, citing BAMF, whose statement on Twitter acknowledged that regional offices currently lack the necessary tools, without specifying a percentage. Top government officials have warned that the ongoing influx of refugees is having a severe impact on Germany’s welfare system, insisting that the country’s asylum policy must be changed in order to alleviate the financial burden. “[Our] population demands all-out registration and a standardized procedure for checking the identity of all refugees who have come to Germany over the past two years,” German Development Minister Gerd Mueller said in early January, according to Die Zeit. He also warned of the dire consequences for the society if the government fails to tackle the refugee issue in a proper way. Opposition parties, including the Greens, have nevertheless dismissed Mueller’s proposals, calling them “hollow statements,” according to Die Zeit. Meanwhile, cases of social benefit fraud and fake identities involving asylum seekers in the German state of Lower Saxony are estimated to have cost taxpayers up to €5 million (around $5.3 million), Deutsche Welle reports. The issue of multiple identities also came into the spotlight in December of last year, when it emerged that Anis Amri, a Tunisian suspect who rammed a cargo truck into a crowd at the Christmas market in Berlin, had used 14 aliases.